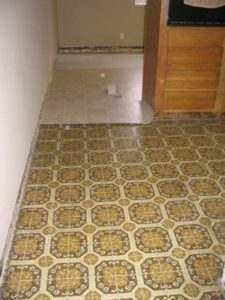 Linoleum floor removal is a time-consuming and labor intensive job that will payoff, if you stay the course. It’s not necessarily complicated but it is time-consuming and requires a lot of hard work to get it done and the right results without causing unintentional damage. It’s easy to cause damage to the subfloor when removing linoleum, usually due to the glue and tools used to pull it up. Not to mention the fact that you’ll need to rent a few tools you might not be familiar with using. Like most big home improvements, linoleum floor removal is serious business. Not because it requires a host of specialized tools or skills. But, because it’s just difficult. It’s very work intensive and takes a whole lot of time and effort to get it done. And, also like a number of renovations, you’ll need to plan in advance for what to do with the remodeling debris. This is due to the fact that linoleum flooring can contain hazardous materials, like asbestos. For older homes, this is more likely and that means you can’t just toss it out on the curb or even put it in a dumpster you rent. It’s best to have a junk removal service come and pick it up, instead. This way, you won’t have to deal with the hauling or disposal. Test it for asbestos. It’s of utmost importance to first confirm it’s safe to proceed. Which means you need to test of asbestos to ensure that it’s safe to take up on your own or it requires a professional service. Pull the linoleum up. As for the actual linoleum flooring removal, it starts in a corner. Pick a corner and use a knife and/or needle nose pliers to begin to peel it up from the subfloor underneath. Once you have part of it up, then pull up the rest gradually. Scrape off the adhesive. After the linoleum is off the subfloor, there will likely be adhesive patches about the room. Unfortunately, you can’t just leave the adhesive on the subfloor because it can cause unevenness and other problems. Use adhesive remover, following the manufacturer’s instructions carefully. Once you’ve taken up all the linoleum floor, just phone 800-433-1094 or visit Junk Garbage Removal.